Notes from the Three years of interconnected riots. Emergence, evolution and challenges of the network movements in the context of the #GlobalRevolution , organized by the Communication and Civil Society programme of the IN3 in Barcelona, Spain, in October 23, 2013. More notes on this event: globalrev. How is it that the movement can mutate and update so quickly? What is the role of “forks” within the network movement? It is quite clear, though, that (1) the Spanish Indignados Movement (#15M) is a “movement in movement” and that (2) emotions are a substantial part of the network movement, affective mobilization is crucial. There is a need for new forms of organization as a network that are capable of making decisions and fixing errors in real time. It is also important the policentric and/or distributed character of the network, as a live or mutating organism. Codes are open and are replicable. Networks are open and contagion becomes global. The #15O movement (global demonstrations on October 15, 2011) is a good example of both fork and evolution of the movement, of replicating it at a global scale. How are these replicas created? These movements that aim for the global movement hold powerful links and relationships between the collective identities of the different nodes or movements or sub-networks; they share codes, they share memes and hashtags; they also have in common bridging the physical and the virtual layer. These new movements, and in an increasing way, begin to have a major impact on mainstream media. The movements also have the capability to hack and transform forks or parallel movement, “embed some code in them” and transform their very nature to turn it towards the movement’s goals, thus mutating the original fork into part of the core movement. The Plataforma de Afectados por la Hipoteca (PAH), on mortgages (truly speaking it existed before the 15M movement, but the nature is the same one). The 15MpaRato project, to try presumably corrupt bankers. One of the latest mutations is the Citizen Network Party X, a political party born within the 15M movement, with the formal frame of any other political party, but with an inner organization very much like a network movement. It’s not only the words that are being said, it is also about the things people are doing while saying these words or just because they said these words. Net Work: the use of one’s free time in a specific project by using one’s own resources. Most of the people that participate in Net Work are already knowledge workers whose job is to move around (create, mix, disseminate) knowledge. No one is in charge of infrastructure, as infrastructure is decentralized and is used indistinctly and flexibly by net workers. Occupy uses multiple channels for collecting, sorting, collating, and broadcasting information for the purpose of coordinating action: the public space, websites, etc. Rhizomatic communication: multiple channels for collecting sorting, collating, and broadcasting infromation for the purpose of collective action. After hurricane Sandy, many turned to the Net to help the victims of the hurricane — and #SandyVolunteer was born. But quickly the demands for information outpaced the supply of it. Then InterOccupy, an already established group, reorganized and turned towards the goal of helping #SandyVolunteer, and then came #OccupySandy. Many matters of infrastructure usually come after ideas are put into practice: first act, then build. The website, the channel to accept donations, the mailing list and e-mail account, voice conferences to massively broadcast information and answer questions… a whole constellation of tools and people were put into work to support the network of volunteers contributing to alleviate the impact of Sandy. A principle: Occupy Sandy is mutual aid, not charity. 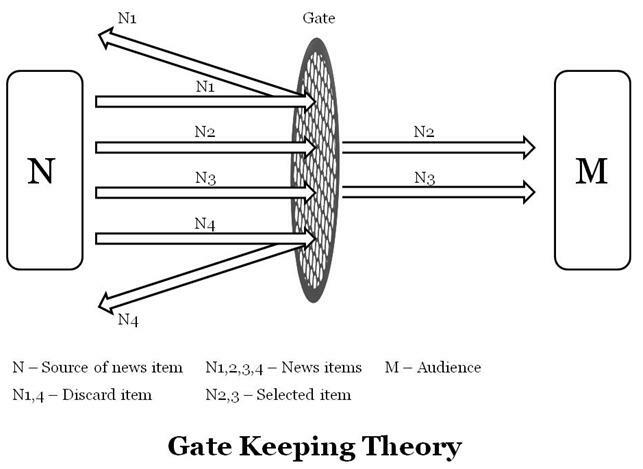 Networks can be reconfigured, reoriented. It just takes a clear and legitimate goal, and finding out the right people with the right skills to leverage the power of the network. The history of YoSoy132 can be traced back to 2009, when the government provides no satisfactory answers to the influenza pandemic during that year. It is the same people that would protest against the government for such poor information that will reorganize themselves around the policy to tax the Internet and create the #InternetNecesario movement. After that, mass media begin to acknowledge that what happens in social networking sites can no more remain ignored. This is especially relevant when protests shift again, this time to ask for a null vote in the 2009 elections. With time, we can see that social movements begin to create patterns of behaviour that can somewhat predict the evolution of the movement, its degree of participation, etc. So, social movements are certainly impredictable but some likelihoods of specific events and evolutions can be established after data analysis. See the analysis on Google Trends by several terms causing citizen unrests developed by Alberto Escorcia. Q: How do we measure impact? Is it the PAH the only one making an impact? Arnau Monterde: Indeed, most networks are if not integrated they are connected, even if many people do not realize that. For instance, much of the muscle behind and besides the PAH comes from the 15M network movement. The PAH is a school of activism just because it shares not only the values but the resources and the people of the 15M movement. So, the impact is actually not the PAH’s, but the impact of the whole network, despite the fact that one of the nodes may be more visible than others. Occupy, Solidarities, and Net Work by Joan Donovan. Collective notes taken on Titanpad. During the year 2012, the research programme on Communication and Civil Society of the Internet Interdisciplinary Institute carried on a series of research seminars on Internet, net neutrality, hacker ethics and digital culture and on Internet, institutional crisis and new institutionalism — the later, coordinated by myself. 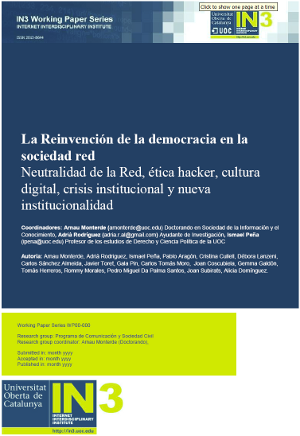 The result of that work is the recently issued working paper La reinvención de la democracia en la sociedad-red [The reinvention of democracy in the network society], coordinated by Arnau Monterde Mateo, Adrià Rodríguez and myself, and which has been published in Spanish. I want to very sincerely thank Arnau Monterde for the opportunity he gave to me to take part and coordinate one of the seminars, and acknowledge the huge amount of work that Arnau Rodríguez devoted in putting all the pieces together. On the other hand, the final paper would not have been possible without the contributions of the participants that attended the seminars. In no particular order, and besides Arnau, Adrià and I, those were Pablo Aragón, Cristina Cullell, Débora Lanzeni, Carlos Sánchez Almeida, Javier Toret, Gala Pin, Carlos Tomás Moro, Joan Coscubiela, Gemma Galdón, Tomás Herreros, Rommy Morales, Pedro Miguel Da Palma Santos, Joan Subirats and Alicia Domínguez. A warm thank you to all of them. From the Arab Spring, through movement occupywallstreet or 15M it has been opened a new cycle of political network movements which propose many new elements regarding the political use of new technologies and the Internet to collective action. These new movements see the network not only as a tool or battlefield, but also as an organizational form, establishing a relationship that commonly has been linked to ethics and ways to do of hacker communities. Moreover, the financial crisis in Europe is deepening blocking political institutions that have been building since the beginning of modernity. This crisis is expressed not only in the inability of these institutions to tackle the current economic, social and political, but also in its complicity with the mechanisms of financial dispossession. Such institutional crisis determines the need to exercise both a critical and process of invention and construction work that starts from the new technological possibilities and lessons of network movements, hacker culture and free software, which enable reinventing institutional and constitutional forms, and therefore also of democracy itself.